Quilting hint for the day: Do not get soy sauce on your New York Beauty paper piecing patterns. You will not want to use them after that. Do you have a restaurant or bar you go to that is like Cheers – everybody knows your name? 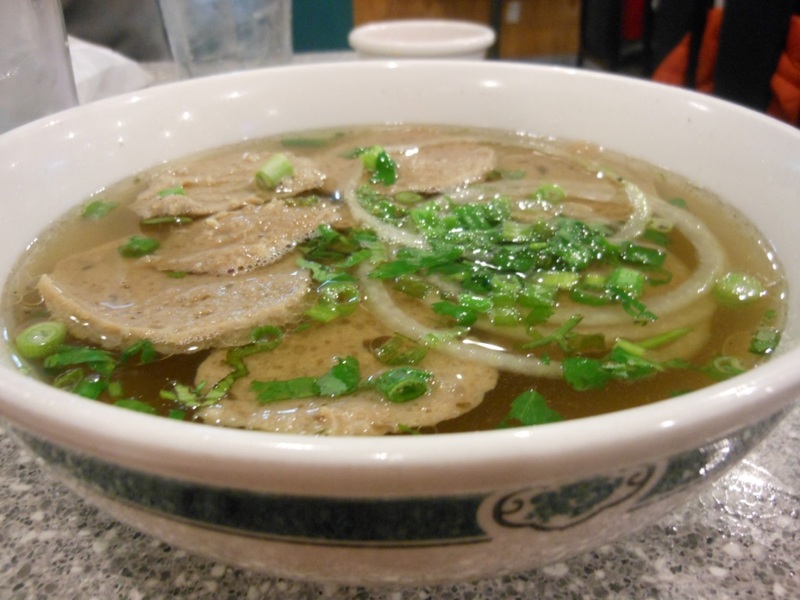 Well, we have one – the Pho place near our house. Pho 78. Well, the young good looking waiter has to be working, but he knows us. He just yells from behind the counter – “Usual?” And we say yes, and then I have to give him a big tip because he knows what the “usual” is. Spring rolls, and he knows that I am the only one that eats them, not Ken, and only brings one plate. I personally think these are the best spring rolls with the best peanut sauce, at the most reasonable price, that I have eaten in the Denver vicinity. 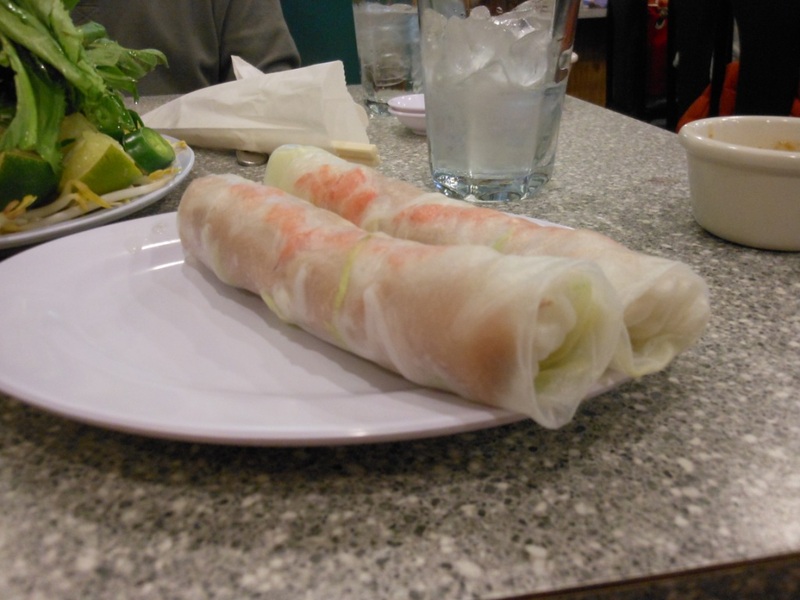 (For those of you that may not have access to spring rolls, they have lettuce, bean sprouts and basil, with pork slices and shrimp, wrapped in rice paper, with a peanut dipping sauce.) You should try them. Note the garnish plate for the soup behind the spring rolls. It contains bean sprouts, Thai basil, lime wedges, coriander and jalapeno slices. Our waiter knows to bring extra jalapenos for me. The usual serving is 3 or 4 slices. Last night, I got 12. I don’t like to EAT the jalapenos, but I put them in the broth and smash it around and make the broth spicier. The pho (pronounced ‘fuh,’ not ‘foe’) is an amazing clear beef broth with rice noodles, except I don’t like the noodles, so I have a side of rice instead. I prefer to savor the broth as much as possible. And there are various types of meats you can get in the broth, from rare steak, which they put in raw in the kitchen and essentially cooks in the hot broth, to shrimp, tripe, brisket, and meatballs. I like the meatballs (they are sliced into the soup.) After I have stirred the jalapenos in, then I add sriracha sauce. Mmmmmmmm, good for what ails you. This is a SMALL by the way. 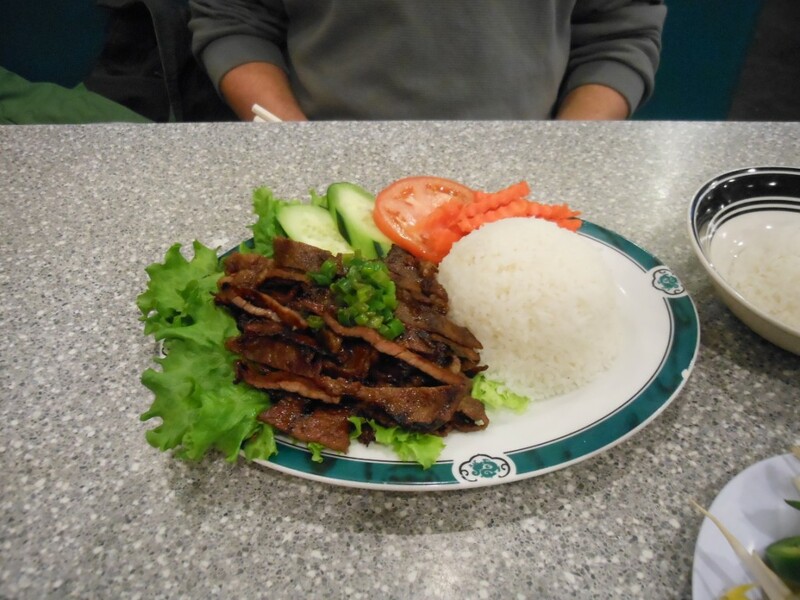 Ken gets a beef and rice dish, with the beef in a sauce that I like too but not nearly enough not to order the pho. You do have to be careful and order in the restaurant if you want a to go order, because the gentleman who answers the phone doesn’t always understand, and one time when I wanted rice instead of noodles, I got 5 soups instead. Of course Ken just picked it up and assumed I had my own plan (usually wise on his part) and didn’t question why there were 5 soups in there. Could you make your own with canned beef broth? I think it needs to be more complicated than canned beef broth, there a lot of herbs in there, including star anise. The recipes I have seen online are complicated. But oh is it soooo good. One of the few things I miss about living in an urban area is the ability to get food that is not hamburgers or pizza. Thai food is my particular weakness. And no, I’m not about to make it myself. Like you said, it’s complicated, with a lot of spices. Restaurant food, for sure. So true, Kristin, the times that I have TRIED to make anything like that (and I LOVE Thai too) it has not turned out well and then I have a bunch of weird leftover ingredients I will never use again.